What a difficult struggle the last several days have been. I have tried to function but have been broadsided by several things at once. I have asked God to draw near, He has made me a promise that He would never leave me, or forsake me. I hold on to this and will not let go. Where would I be without them? The Bible is full of God’s promises, especially the Psalms. I believe the Psalms have a special meaning for those who struggle with issues (like a mental illness.) Many times when troubles have been abundant, I have opened my Bible and found a precious promise waiting for me that has proven to be a great comfort. If we simply trust Him with everything (Philippians 4:6-7). Its length, and depth, and width are determined by my action with the promises. By squeezing out His promises I can find hope to continue on with life. For me, the Word is more important than life. Some have described depression as the ‘common cold’ of the mental illness world. 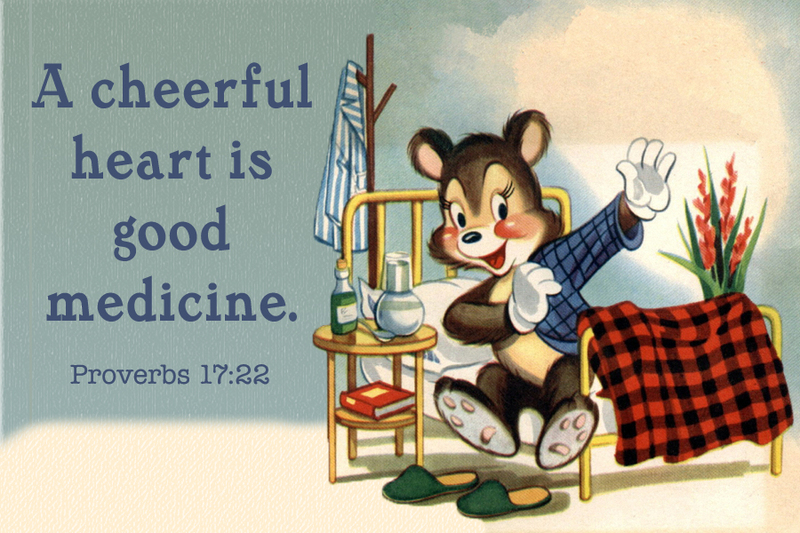 If that is true, then God’s Word is the Vitamin C. I can’t prevent a cold, but I sure can reduce its impact. How severe will it get this time? I woke up this morning, and before I even opened my eyes I could feel the oppression of depression. I want to die, why did I wake up? Maybe if I close my eyes I will be able to go back to sleep, and not wake-up. To the depressed, sleep (death’s cousin) is easiest way to escape. It provides a profound release from the anguish of depression. But there isn’t a 24 hour sleeping pill yet. I find I want to deal with my depression in two ways: Escape or deny. Both avoid the real world. And both have a tremendous impact on the way I function. God’s promises to help you are real and profound. Properly administered, they offer hope and life beyond taking an anti-depressant. Consider them to be the medicine your soul needs! This article was originally posted on my blog, Linda Kruschke’s Blog, here. When Pr. Bryan asked me to contribute to Broken Believers, I knew this was one post I wanted to share here. Important caveat: In this article I am not suggesting that unforgiveness or other unrepentant sin is the root of all depression. There are many causes of severe depression. Sometimes the depression of a person can have multiple causes and exacerbating factors. This is just my story, and I believe I’m not alone in the root of my struggle. I write this for those who, like me, have been hurt and have hung onto the bitterness that such wrongs can cause. As I write this, I’m sitting in the Portland, Oregon airport waiting to board my flight to Boston with a layover in Houston. It’s 10:47 p.m. and I’ll soon (I hope) be on the red eye, trying to get some sleep. I doubt it will be the kind of deep sleep that leads to dreaming. For the past couple of days a blog post idea has been flitting around in my head that has to do with dreaming. Or more accurately, it has to do with a specific dream. I decided this was the perfect opportunity to write that post. This is a true story of a dream I had 13 years ago, but it is as vivid in my memory today as it was the moment I awoke from it. But before I get to the dream, a little background (some of which those who have read much of my blog will already know, some of which I’ve only shared one-on-one with people I know). I had been struggling with major clinical depression for almost 7 years. There had been some good days, weeks, maybe even a month here and there, during that 7 years. But never any lasting relief. Even before that I had dealt with low grade depression for a long as I could remember. Through it all I blamed one person for all my misery. I’d been blaming him for almost 20 years. I was sure what he had done was the reason for my depression and that there was nothing I could do about it. I had become convinced that I would always be miserable. My regular mantra was that he had ruined my life. So you might be wondering what he did that was so terrible. I’ve thought a lot about whether I would include that piece of information here. I’ve shared it with friends, but I’ve decided not to do so in my blog. I believe that this post will have a greater impact if I don’t because the principles I learned through this story aren’t dependent on the wrong that was done to me. Just as we don’t know what the thorn was in Paul’s side that he asked the Lord to remove (2 Corinthians 12:7-10), so that his story has a universal message that Jesus’ grace is sufficient for any suffering, I think my story will have more universal appeal if the reader can fill in the blanks with whatever wrong has been done to them. Still, I was in utter despair and medication was not helping. I mentioned in a previous post about my friend June who invited me to my first Bible study, which happened towards the end of my 7 years of major depression. It was while I was attending this Bible study on a weekly basis that I had the dream. Okay, now to the dream. It started out with me standing at the checkout counter at the grocery story. I paid for my groceries and turned to leave. There he was, on his knees, asking me to forgive him. But I walked away. Suddenly I was at the post office mailing some letters. I finished my business with the postal clerk and turned to leave. There he was again, on his knees, asking me to forgive him. But I walked away. This scenario was repeated at the bank, the library, and several other of the regular places one goes in life. He was everywhere in my life in this dream, but not trying to ruin it. He was always asking for forgiveness. I awoke from the dream and knew immediately what I needed to do. God had been trying to tell me this very thing in various ways for quite some time, but I hadn’t listened. I couldn’t ignore this clear message of forgiveness. So that is what I did. It wasn’t easy, and I had to pray for God to help me, but I forgave him. Suddenly a flood of names came to my mind. People who had “trespassed against me” in some way or another over the years; people I was holding a grudge against. All the bitterness I had been holding in my heart came pouring out and I began to cry. I asked God for forgiveness for my failure to forgive for so long. The effect on my depression was not immediate, but it didn’t take very long compared to how long I had been struggling. Within just a few months I was off antidepressants and have not had to take them since. There are still days, sometimes weeks, when the darkness returns (though not as deeply as it had consumed me for those 7 years). For me, I can usually trace the lurking threat of depression to someone I’m angry with, someone I need to forgive. I’m reminded of the lesson of dreaming of forgiveness.